Perhentian Trans Holiday Sdn Bhd is the only operator offering ferry service from Perhentian Island to Kuala Besut and vice versa. Perhentian Trans Holiday Sdn Bhd was established on 12 September 2014. You can book your ferry ticket online at BusOnlineTicket.com and enjoy travelling to your destinations. Simply go to BusOnlineTicket.com and book your ferry ticket from Perhentian Island to Kuala Besut for travelling with great prices. The trip duration for the ferry from Perhentian Island to Kuala Besut can take around 30-45 minutes by speedboat, depending on the weather and tidal condition. The service from Perhentian Island to Kuala Besut Jetty starts early in the morning at 8.00am, then 12 noon and the last departure in the evening at 4.00pm. 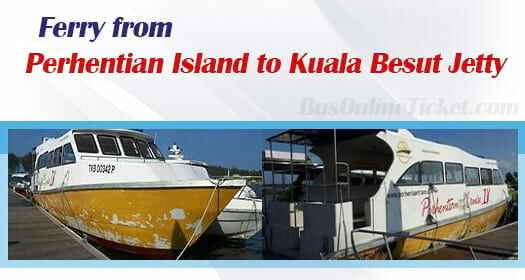 The ticket price for ferry from Perhentian Island to Kuala Besut Jetty is RM35.00 per way. Perhentian Island is one of the most popular islands in Malaysia, two of which are large and developed for tourism. The island offers various spots for snorkeling and scuba diving. The journey to the island was relatively stress-free so you can just relax and embrace the nature. In the surrounding areas of Perhentian Island Resort and hotels, you will find many things to do and it is an ideal place to go for swimming. There are many popular activities on the island including sun-bathing, kayaking and jungle trekking. By the speedboat, you can also go to many more nearby islands that you can explore by island hopping.